Why You Need To Go To A Wedding Fayre! The Ultimate Wedding Fayre Guide For The Bride & Groom! Planning your wedding needn't be time consuming or stressful! First of all, congratulations on your engagement! This is the moment you’ve been waiting for and dreaming about for a long time. So he got down on one knee and you said yes! 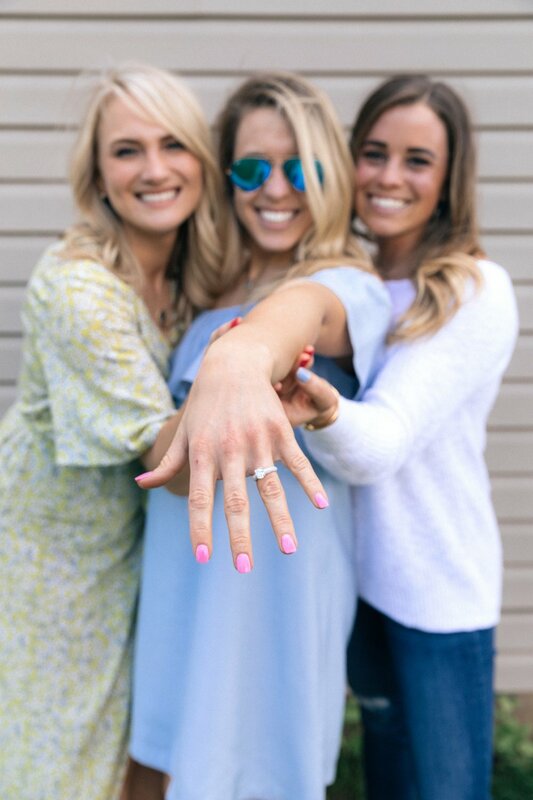 You’ve shared the exciting news with your friends and family and have of course taken the obligatory engagement ring selfie! The next stages can be a bit of a whirlwind; many brides-to-be can feel overwhelmed and unsure how to start planning their wedding. You’re itching to get going, but don’t know where to start. Wedding fayres are the perfect place to get inspiration and ideas, speak to different providers, get advice and start booking your wedding day services - but most importantly, it’s a chance to start having fun and enjoying the journey. Wedding fayres are a fun day out, especially if you bring along your fiance, bridal party, family and friends! There are many freebies, drinks, live catwalk shows, live music, makeovers as well as hair and makeup demos. Most importantly, wedding fayres are the only place where you can find all your perfect wedding suppliers under one roof, which means you can ask all the questions you need, get expert advice and book your favourite suppliers all on the same day - with your loved ones with you to help you decide! Planning your wedding is such a personal and emotional experience, so it’s vitally important to be able to make an emotional connection with your supplier. After all, they are going to play a big part in your special day, so you want to make sure you connect! Wedding fayres allow you to make that personal connection with the person who will be supplying the services for your wedding - making you feel much more confident and secure! Plus, many vendors offer samples, testers, freebies and even discounts on the day, which can help save you tons of money! How Can You Get The Most Out of Your Wedding Fayre? It’s always good to speak with your significant other and talk about what you will be looking for. Take a look online and get some inspiration too - even if it’s only to decide what you don’t want. A bit of preparation will really help. Bring your diary, your wedding planner and tick off your do to list. Bring your fiance, friends or family with you. These are the people who know you best so can offer you a second opinion, and sometimes it’s important to have a little bit of reassurance from someone you trust when making decisions about your big day. Child are also very welcome! Lots of our exhibitors offer you special offers on the day if you pay a deposit, so be ready to book to secure your date, supplier and get some special offers and amazing discounts! Sign in and sign up! Sign in when you arrive and be sure to sign up to any exhibitors mailing lists that may catch your eye! They can send you details of their packages and any new deals and products they have! By signing up you will be the first to receive these offers and new products! Why not be organised and set up a new personal email address just for your wedding so you have all your exhibitor offers in one place! Be yourself and get to know providers on a personal level. This is the perfect opportunity to build a connection with your potential supplier and it’s really important to feel connected to the suppliers creating your wedding day! Don't be shy and chat with as many exhibitors as you can, get to know them and what they have to offer you. This is your big day, and your wedding is a pretty emotional event, so make sure you follow your gut. If you have a good connection with a supplier and feel good with them, then it’s the basis of a perfect wedding supplier relationship! It’s important to feel good about the wedding team around you, so make sure you’re listening to your instincts on the day! If you don’t book something on the day, make sure to take a business card (and a flyer/brochure if the exhibitor has one) so you can keep in touch with the contacts you made on the day and follow up later. Well maybe not you, although it’s not prohibited! But do make sure to watch the catwalk shows - we have the very latest in trends and fashion so be sure not to miss out! Most importantly, this is a day you should enjoy! You have your loved ones with you, a team of experts at the venue ready to help and the chance to plan your perfect day! Enjoy it and have fun! We are experts in wedding fayres - in fact we have been doing wedding shows for over 7 years and have helped thousands of happy couples plan their perfect wedding day! We work with only the best of wedding professionals, and bring them together in beautiful venues to offer you expert advice and inspiration for your wedding day! We always host a wide variety of exhibitors including Beauty, Cakes, Catering, Decoration, Dresses, Entertainment, Event Planning, Florists, Health and Fitness, Jewellery, Photography and Video, Transport, Venue, and even Honeymoon services! 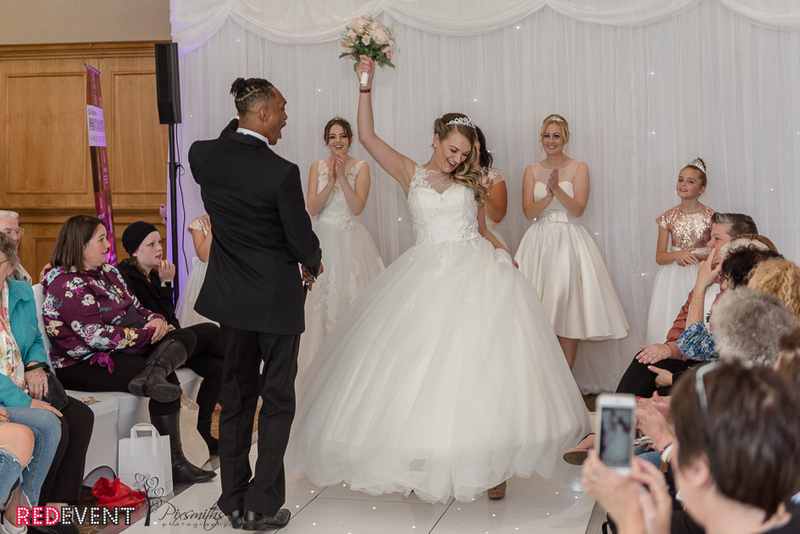 We have fantastic catwalk shows and hair and makeup experts who offering mini makeovers & demonstrations, showing you the latest beauty trends for your wedding style. Not only that, but we have live music and performances, creating a fun, special and unique experience for your and your bridal party where you can plan every aspect of your wedding in one beautiful, fun-filled afternoon! All of the Red Event Wedding Fairs are free entry and all those who register are entered into our free prize draw on the day! Read what happy brides have had to say about our Red Event Wedding Fayres!